Air handling units are used in nearly all new and renovated buildings to ensure high-quality indoor air. In addition to providing clean indoor air, HK Instruments’ easy-to-use devices enable cost-efficiency and the effortless installation and monitoring of air handling units. In comparison with analogue devices, modern Modbus devices require less wiring, which reduces the cost of cabling work. 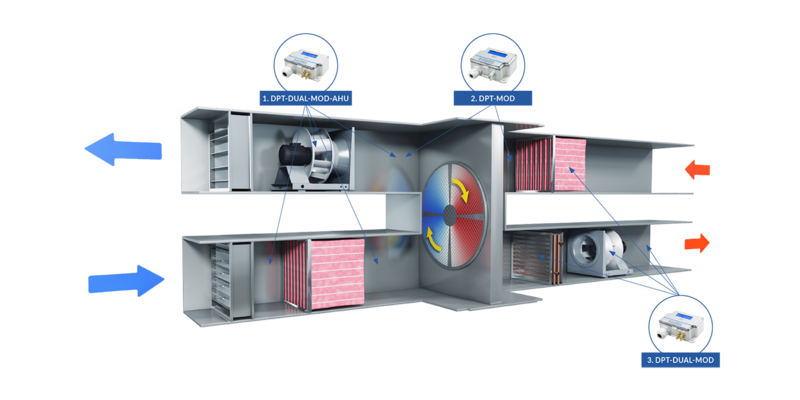 Designed specifically for AHUs, the DPT-Dual-MOD-AHU combination is the only one of its kind on the market..
DPT-Flow (1) enables accurate air volume flow adjustment and control for supply and extracted air. DPT-R8 (2) monitors filter cleanliness and frosting in the heat recovery unit. 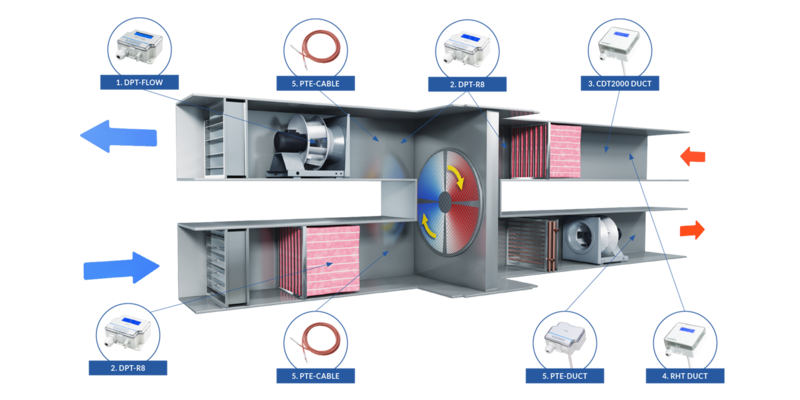 The CDT (3), RHT (4) and PTE (5) sensors ensure demand-controlled ventilation. Our main products are also available with Modbus communication. When using a bus solution, you need less wires in cables and fewer input points in the controller. As a result, you will save in costs of the devices and installation. DPT-DUAL-MOD combines two differential pressure transmitters into one device. When using the Input terminal, temperature transmitters can be replaced with temperature sensors. This makes it possible to measure four different types of data. With the Modbus solution you only need 4 wires as opposed to 23 wires when using the traditional solution. In a Modbus solution, DPT-Dual-MOD-AHU (1) monitors and controls air volumes. It also functions as a filter alert, replacing two separate measuring devices: air flow transmitter and differential pressure transmitter. DPT-Dual-MOD (3) is the right choice when you want to monitor and control duct pressure instead of air volumes. Two temperature sensors are connected to both DPT-Dual-MOD models. These sensors are essential for the functioning of the air handling unit. DPT-MOD (2) prevents frosting in the heat recovery unit.